What an exhilarating experience, to practice WT in another part of the world. 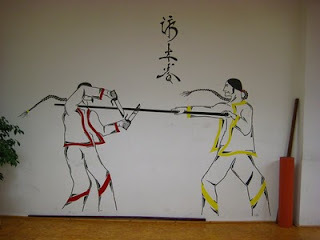 I have been lucky enough already to have trained in the main 3 cities of Canada involved in Wingtsun, namely Toronto, Vancouver, and most recently in Calgary. Now, I can add Ulm, Germany to my list of WT journeys, albeit only for 1-2 classes. Why Ulm? I visited for a very exciting Interdisciplinary Fascia Course as part of my career journey. Interestingly enough, as a side product of this course, I have learned a few things about fascia as it relates to body movement that can likely be applicable to WT. More on this in a future post, including a lecture slide with a photo of Bruce Lee. 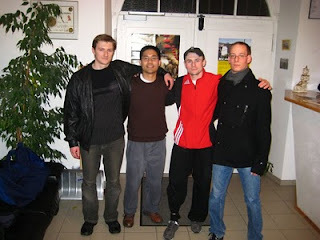 Before flying out to Germany, I had e-mailed Sifu Bodo of WT Ulm about a possible visit. On the night of March 24th, when I visited the school, I was first met by a couple of students outside. There was lot of sign language for a few minutes mixed with a couple of phrases from the handy “Lonely Planet German phrasebook”. Then another student arrived who spoke a bit more English. 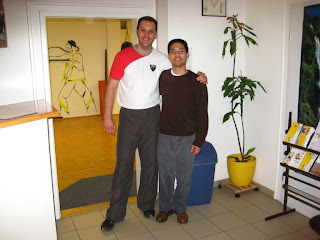 I was then greeted by Sihing Michael, who was generous enough to invite me to train with them. I did not have any of my training clothes, but how could you resist? It was a beautiful gym with training pads, nice photos, the usual Wooden Dummy, etc. Standardized start of the class with SNT and CK. Then off to various drills. - The whole body must be taken advantage of, using all of the joints including the back; there were no frozen and stilted bodies in this class! Then, after various chi sau and lat sau exercises, the night was coming to an end! Then Sihing Michael said “Time to work up some more sweat!” Push-ups, leg raises, back extensions, chain punching… followed by some stretching. By the way, “liegestütze” sounds just as painful and tiring as “push-ups”. WT Ulm – highly recommended! Tune in for more about day 2 of 2. Great post, Evan. Looking forward to read the next note! Thanks - it really is a fun experience! It'll be a surprise if I even visit 100 schools alone!